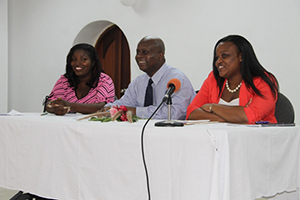 NIA CHARLESTOWN NEVIS (November 24, 2014) — Students of the Charlestown and Gingerland Secondary Schools are now more aware of colleges and universities they could attend after completing high school. 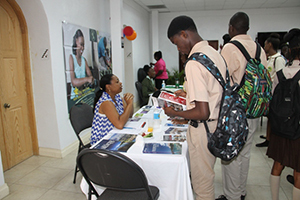 A number of local, regional and international universities had the opportunity to woo them to their campuses at a college fair on Monday 17th November, 2014, at the St. Paul’s Anglican Parish Hall. 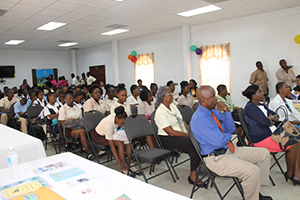 The Nevis Public Library’s 8th annual International College Fair showcased representatives from the Clarence Fitzroy Bryant College, St. George’s University, University of the West Indies, University of the Virgin Island, Emporia State University, Monroe College, Quinnipiac University, Development Bank of St. Kitts and Nevis and Sagicor Life Insurance. Permanent Secretary in the Premier’s Ministry Mr.Wakely Daniel, on behalf of the Premier and Minister of Education Hon.Vance Amory, gave welcome remarks at the opening ceremony. He spoke to the students of the importance of pursuing tertiary education. “A person who would have gone off to university stands a much better chance of being socially promoted. Stands much better chance of improving their station in life,” he said. Featured Speaker Ms. Kerrilyn Edwards, a graduate of the Midwestern State University, urged students to make the best use of the opportunities available to advance their studies and to set goals and work hard to achieve them. 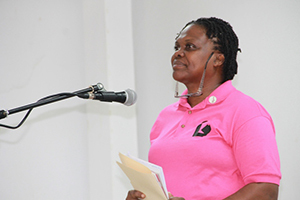 “As young persons, we have so many opportunities to advance ourselves that our parents and grandparents did not have and therefore, it is imperative that we make the best use of these opportunities… Nothing that is worth having comes easily,” she said. Mrs. Hanley also expressed gratitude to the institutions for making the Fair possible. “I want to say special thanks. Let me add a special thank you to all the universities who responded to be here with us,” she said.